A giant molecule to fight Ebola virus ? Indeed, these mega-molecules are highly effective in inhibiting the entry of Ebola virus into cells in culture: their myriad branches (up to 120) carry sugars that bind strongly to the receptor used as a portal of entry by the virus. This work, carried out by chemists from the CNRS and the Université de Strasbourg1, in collaboration with colleagues from Madrid’s Universidad Complutense and Laboratorio de Microbiología Molecular, as well as Universidad de Sevilla (Spain) and Université de Namur (Belgium), is published on 9 November 2015 in Nature Chemistry. Immune sentinels present notably in the blood and mucous membranes, dendritic cells detect infective agents thanks to the receptors they carry on their surface, and alert other actors in the immune system. In particular, the DC-SIGN receptor recognizes some of the glycoproteins (proteins onto which sugars are grafted) harbored by pathogens. But this receptor is circumvented by certain viruses (HIV, Ebola, dengue viruses, etc.) which use it to infect cells: binding of these pathogens to the DC-SIGN receptor then favors their internalization. To block the infection, one option consists in designing molecules that will bind to the receptor with stronger affinity than that of pathogens. The strength of this interaction is due to the fact that several of the sugars carried by the pathogen’s glycoproteins bind simultaneously to the receptor. The chemists thus naturally turned to branched molecules, called dendrimers2, which bear sugars at the ends of their myriad branches. However, synthesizing these molecules usually requires a large number of steps; it therefore remains highly time-consuming and only achieves low yields. An international collaboration of chemists has found a way to obtain giant globular molecules based on fullerenes3, bearing 120 mannose-type sugars at their periphery (see image). To achieve this, they used an approach called click chemistry4: they first prepared fullerenes that each carried ten mannoses, then grafted these units on to a central, twelve-branched fullerene. This is the first thirteen-fullerene molecule to have been synthesized. Above all, this construction mode represents the most rapid dendritic growth ever achieved, as the giant molecules can be prepared within a minimum number of synthetic steps (six, compared with twenty using traditional methods), which makes it possible to obtain a relatively high global yield of around 20%. The ability of these mega-molecules to inhibit the entry of Ebola virus was then tested in vitro. These molecules are water-soluble and in no way toxic to cells in culture. Their antiviral activity proved to be remarkable, representing a 33% improvement on that of classic antivirals. This efficacy is due to the large number of sugars at the periphery of the molecule: a model molecule with only 12 sugars is approximately 1,000 times less active, and a molecule with a single sugar is 100,000 times less active. In addition to the Ebola virus, other pathogens (such as the AIDS or dengue viruses) also use the DC-SIGN receptor as their portal of entry into cells. These findings thus open the way to potential applications for these mega-molecules. However, before the molecules constructed according to this principle can perhaps enter the market, they need to go through numerous developmental stages and in vivo tests. 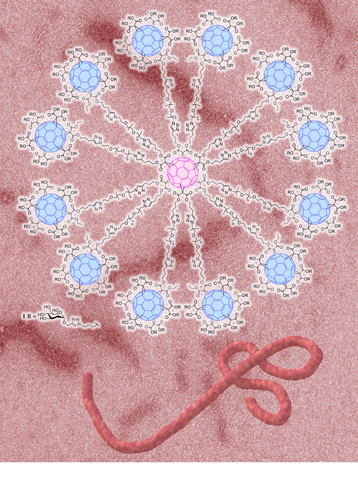 Giant dendrimer comprising 120 peripheral mannose units (diameter: approx. 5 nanometers). The background of the image represents aggregates of the mega-molecule observed using a transmission electron microscope. Below: the Ebola virus (not to scale). Characterizing a molecule of this size is a real challenge: it required the mobilization of a whole range of techniques: electron microscopy (to determine the shape), NMR, Fourier transform infrared spectroscopy and X-ray photoelectron spectroscopy (for composition), and dynamic light scattering (for size). This molecule has very strong affinity for the DC-SIGN receptor that is used by the Ebola virus (shown at the bottom of the figure) to enter its host cell. It binds to DC-SIGN, thus preventing the interaction between the virus and the receptor and blocking entry of the virus into the cell. 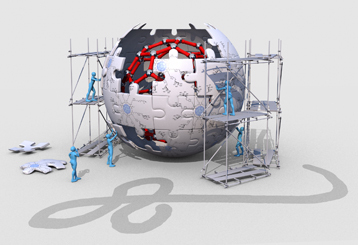 Artist’s impression: scientists building a giant globular molecule to combat the Ebola virus (pictured underneath, as a shadow). 1Laboratoire de Chimie Moléculaire (CNRS/Université de Strasbourg) and Laboratoire de Conception et Application de Molécules Bioactives (CNRS/Université de Strasbourg). 2A dendrimer is a molecule organized around a core from which branches and their successive sub-branches radiate (suggestive of a tree). 3A carbon structure discovered in 1985, which can take the form of a 60-atom sphere reminiscent of a football. 4Click chemistry is a method that enables the rapid synthesis of very large compounds by joining sub-units together through selective and effective reactions that can operate under numerous conditions. Iwona Nierengarten, Michel Holler, Jean-Serge Remy, Kevin Buffet, Stéphane P. Vincent, Javier Rojo, Rafael Delgado, Jean-François Nierengarten and Nazario Martín. Nature Chemistry, 9 November 2015.